The self-proclaimed “gold-rush” into Myanmar has generated significant buzz throughout international and investment circles. In what is one of the least developed markets in the world, Myanmar’s obstacles parallel its opportunity for growth, prosperity, and ultimately development for its 51.4 million citizens. economies given its population and untapped potential. Though the country’s promise continues to unfold, it will need significant improvements in both legal and economic infrastructure before mobile money can be a reality that is utilized by its population. To give some background, just 1% of the population was thought to be online three years ago. This grew to an impressive 13 million people online in 2013. These astonishing growth rates are expected to continue according to the Myanmar Computer Federation, which expects around half of the population, more than 25 million people, to be surfing the net in the next three years. Although internet connection is a different phenomenon (and, thus, completes a different life cycle) than that of mobile money, it is a decent proxy to understand infrastructure development and access to resources. In terms of telecommunications, infrastructure and access to mobile phones is growing. Less than 10% of people have mobile phones, but this number (according to Ooredoo) could reach 97% within just 5 years. Myanmar has already seen more telecommunications infrastructure development, increased competition, and dropped prices in the past 4 months than it has seen in its entire history. Qatar’s mobile phone giant Ooredoo, which started services in Myanmar this past August, is now finally confronted with competition of Norway’s Telenor, which launched at the end of September this year. The state-owned Myanmar Posts and Telecommunications (MPT) even entered a joint operations agreement with Japanese telecom firm KDDI and conglomerate Sumitomo to remain competitive against competition. $2000 five years ago to $1.50 today. What does all this mean for mobile money? Well to state the obvious, it won’t be happening right away. There is more infrastructure development needed by both the private and public sector, although that’s off to a good start with Ooredoo planning to spend $15 billion over its 15 year license period. Moreover, mobile penetration rates are still way too low. To follow successful parallels in other developing countries, Myanmar’s mobile penetration rate needs to reach a massive majority of the country. Still, there should be significant interest from the major telecom providers, as well as startups given the presence of major tech companies in Yangon, to provide mobile money services. In fact, this is already starting with some start-ups accepting payment from phone credit. Legal, political, and geographical challenges remain. These uncertainties will provide major headaches to anyone excited to create and expand a mobile money network. 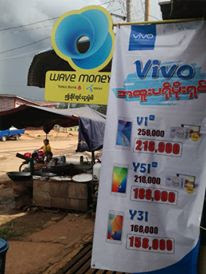 However, the mobile penetration growth rates, increasing competition, decreasing prices, and overall infrastructure development imply that Myanmar has one of the biggest opportunities in the region to successfully leapfrog into the mobile money sphere. If that’s the case, the Myanmar gold rush will be more than just a headline. Saeid Kian works as Business Development Associate in Vientiane, Lao PDR for a consulting firm named Emerging Markets Consulting (EMC). EMC provides management and strategy consulting for private sector firms and development funds with headquarters in Phnom Penh and offices in Vientiane, Lao PDR and Yangon, Myanmar. This blog post does not represent the opinions of EMC and is solely the opinion of Saeid Kian.